A lot of people claim to be acrophobiacs, including myself, but I'm beginning to question that title. After a short Google search, I was unsuccessful in finding an actual phobia for a fear of ladders and/or attic stairs. But Ladderphobia might be more accurate for my needs. I learned that a Ziplinaphobia is not something I suffer from. Nor do a lot of other Austinites. 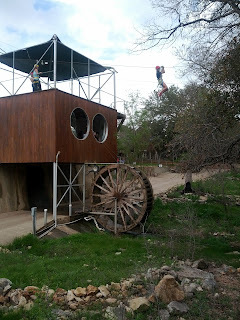 Cypress Valley Canopy Tours is a busy place for adventure-seekers like myself, and I recently got to experience what this place has to offer. 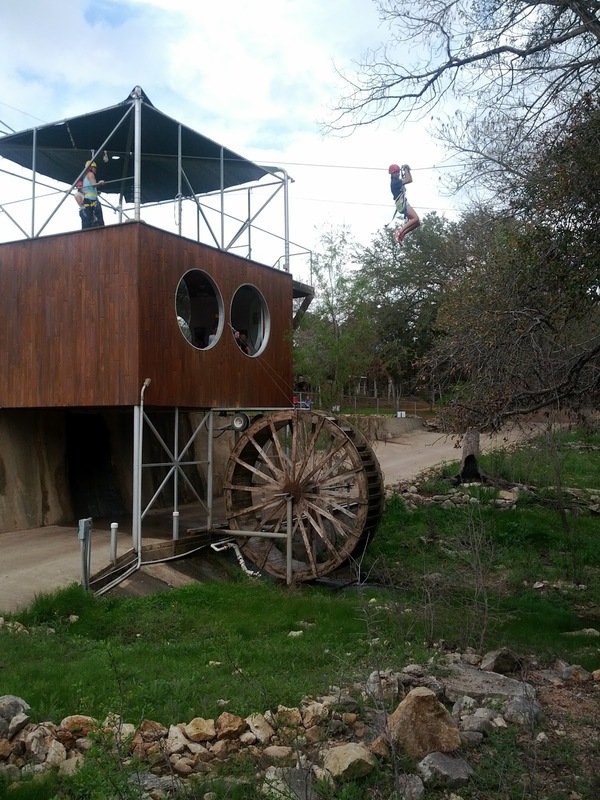 As a surprise for our fifth anniversary, Leyna took me to go ziplining at Cypress Valley. She must know me pretty well, and knew that doing something crazy like flying from forest tree branch to forest tree branch was something that I would love to risk my short limbs doing. Leyna is a self-proclaimed (and now proven) tetherball beast. Despite not dominating a tetherball court since her grade school days, she beat me pretty good, and there may or may not be video evidence to prove it. That's a post for another time. Ziplining required a little training and even more cajones to actually push off and trust a harness, wire and branch strength to hold your weight. If you check out the web site, you can read up on details about how many lines we flew across and other cool aspects of the park. After ziplinin' and tetherin', we ate some PB&J's and snacks by the water and enjoyed the scenery. We had a great time and, if you ask me, we look great in helmets and tight-fitting harnesses.